There is something unreal about Shapotou沙坡头. It should be, and probably once was, a remote outpost. 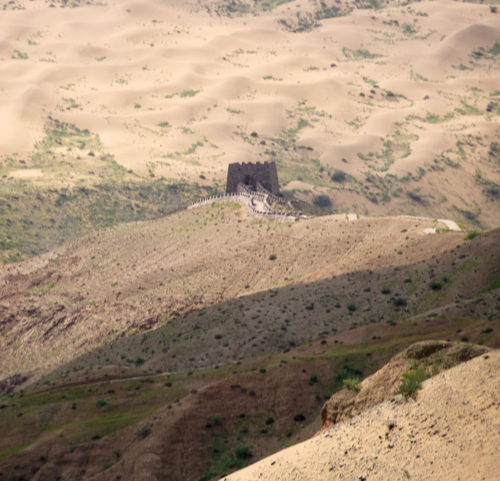 Geographically, it is still a place of stark contrasts, where the harsh sands of the Tengger Desert are halted by irrigated fields; where lush green is separated from sparkling yellow by a dramatic bend in the Yellow river; and all of this comes with remnants of the Great Wall for added lustre. It sounds like something straight out of Indiana Jones. That is, until you arrive at the massive tourist reception center and ticket office and then realize you´ve landed in China’s number one desert tourist hot spot where Walt Disney meets Lawrence of Arabia. As you pass through the computerized turnstile you’ll need to take a deep breath and allow a few moments for your brain to assimilate the mayhem that unfolds in front of your eyes. You’ll probably find yourself asking why you came to Shapotou in the first place. 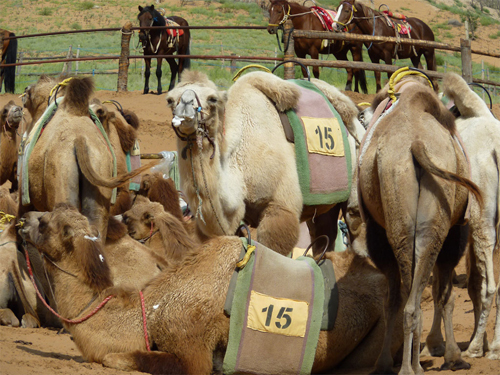 Camels, huge caravans of them, plod up the dunes mounted by camera toting tourists. 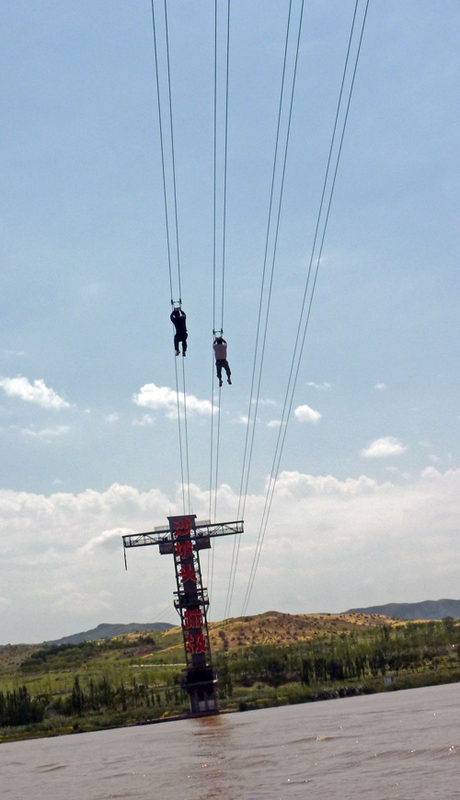 Rope slides, sagging precariously over the sand and water, whizz dangling bodies to and fro across the Yellow River. 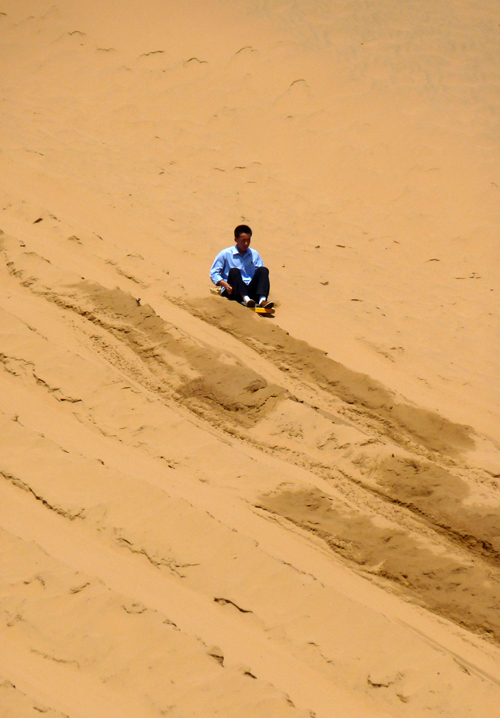 Sledges, that resemble something like a drinks’ tray, sail down the near vertical dunes accompanied by the wails and screams of their riders . And finally, an electric, ultra-modern escalator, which could be straight out of a sci-fi movie, winches the lazy and out-of-shape back up to the top. Not quite the wild China experience that one was expecting, though this being China, we shouldn’t have been too surprised. But before you despair, stop and chill for a second: look beyond the bedlam and you’ll see why you came here. The colossal dune you are standing on drops straight down to the Yellow River. Along the river bank swaying willow branches droop over the water. 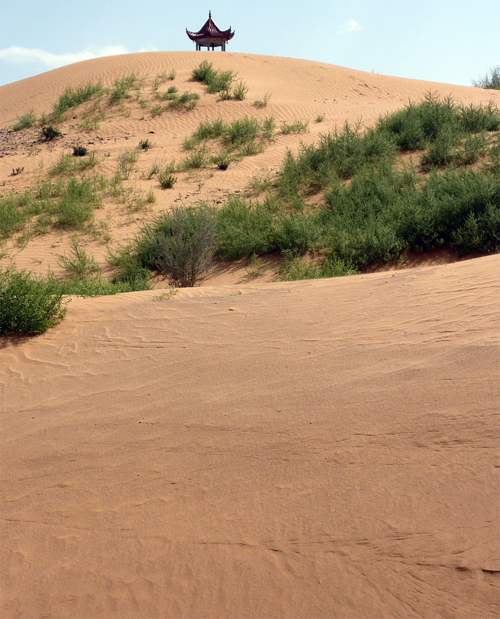 On the other side of the river, mounds of undulating sand dunes amass, piling up higher and higher before smacking straight up against towering mountains. And yes, there is even a small piece of the Great Wall. 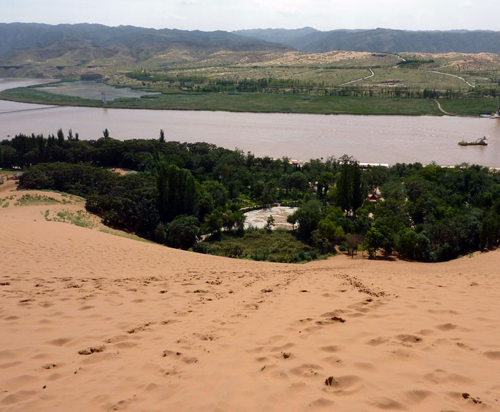 Originally, Shapotou was set up as a desert research center (Shapotou Shamo Yanjiu Suo / 沙坡头沙漠研究所) to investigate desert erosion and find ways of halting the desert’s advance and producing a green belt. This has been done reasonably successfully using a patchwork technique imported by the now extinct Soviet Union (watch this video if you speak Chinese). 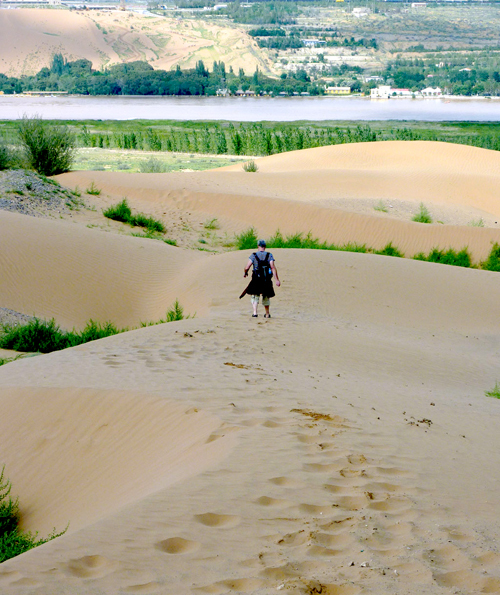 The first thing to do is take off your shoes and run down the enormous dune to the river; it’s a 200 meter sheer drop. Enjoy it. Coming back up, if you don’t pay for a camel or the escalator, is a killer. 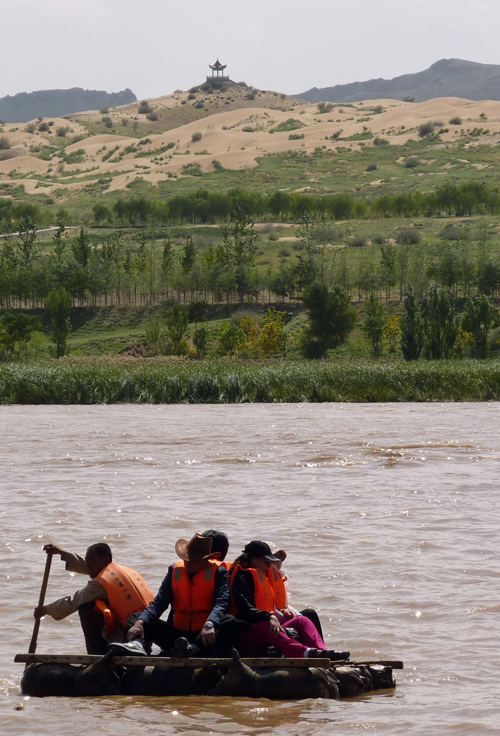 These rafts used to be an important form of transport on the Yellow River. 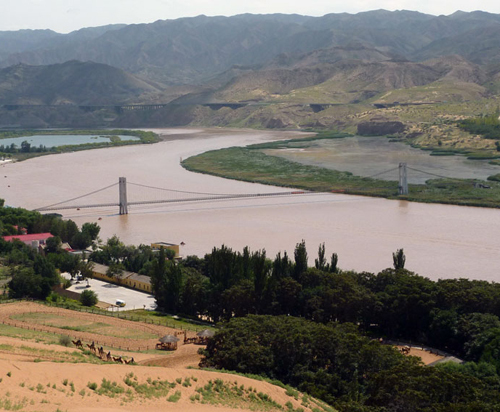 While today they are primarily used to ferry tourists, in the past, these rafts, using up to 600 sheep hides, would carry loads of 30 tons or more, transporting mainly tobacco, spices and people along the 200 kilometer stretch between Lanzhou (Gansu Province) and Baotou (Inner Mongolia). 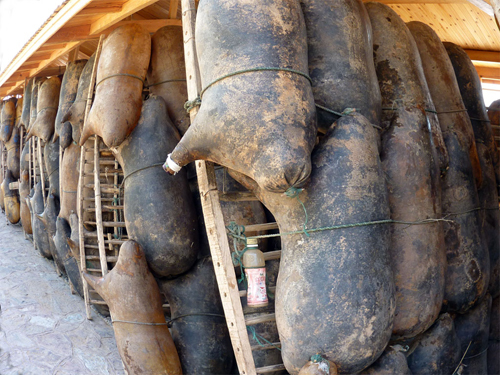 The tourist rafts use about 14 sheep skin hides. After the cold beer take a stroll along the river and cross over the suspension bridge; the crowds immediately disappear. In the distance you‘ll see a pavilion topping the dunes, it makes a great target trekking over the rolling sand. 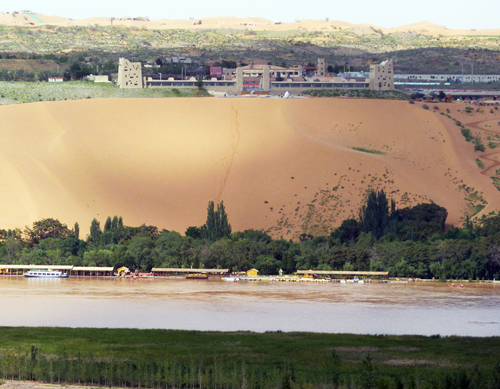 The pavilion is nothing special but the views back towards Shapotou and on to the Gobi Desert and over the Yellow River are spectacular. 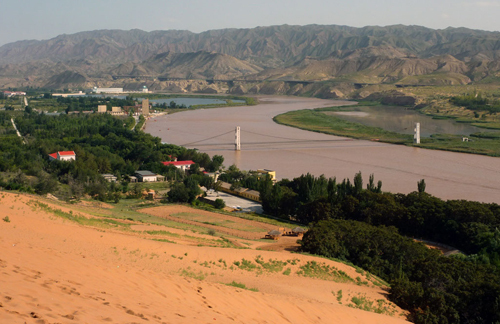 A section of the Great Wall can be seen snaking along a ridge towards the Yellow River. However, even from a distance it looks over-restored, resembling the crenellated brick work of the Great Wall near Beijing rather than the rammed earth style of the Great Wall in the Western regions. Returning to the entrance you have to make a difficult choice. 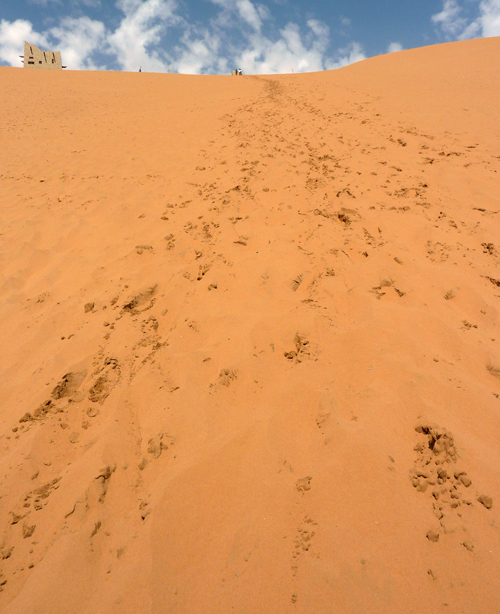 Pay for a camel or the escalator to take you back up; or scramble up the dune. It’s a hard lung busting climb. For every three steps forward you slide back two. 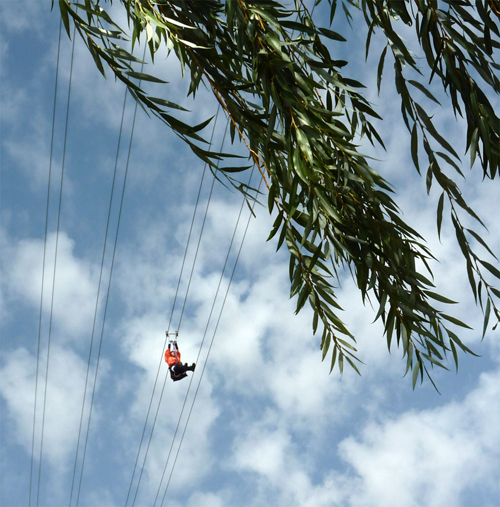 You’ll be gasping for breath by the time you reach the top. However, you’ll be providing the Chinese tourists with plenty of entertainment. 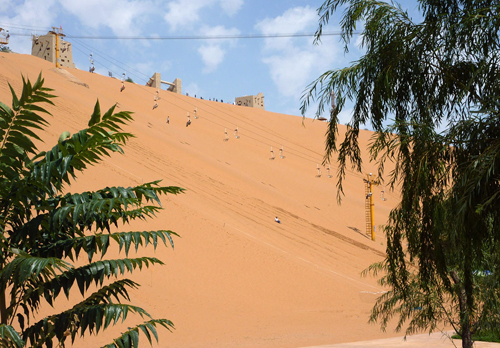 They certainly enjoy the spectacle of foreigners struggling and panting up the dune. They’ll video and photograph you all the way up. We really enjoyed Shapotou. 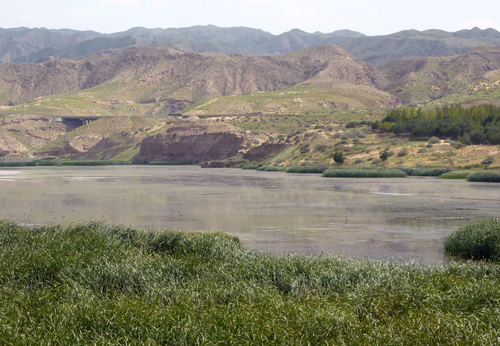 If you are travelling through Ningxia and find yourself in the enjoyable city of Zhongwei, then Shapotou, despite over commercialism, makes for a really pleasant day out. We spent nearly 5 hours there and that’s without having lunch at the pleasant river-side restaurant. If you wish, you can stay the night at a hotel on the grounds of Shapotou. We went to Shapotou from Zhongwei. A Taxi cost 70 Yuan for delivering us and picking us up 5 hours later (you might get it cheaper if you haggle harder than we did). You can also catch buses to Shapotou from Zhongwei’s people’s Square. We got to Zhongwei on an over-night train from Hohhot (same day hard-sleeper tickets) in Inner Mongolia and left on one of the half hourly buses to Yinchuan (3 hours). In Zhongwei we stayed at the execellent Fengmao Yuan Jiudian right opposite the closed for renovation Zhongwei Da JiuDian ( 5 minute walk from the train station). A clean and comfortable double with bathroom and flat screen T.V cost us 160 Yuan. 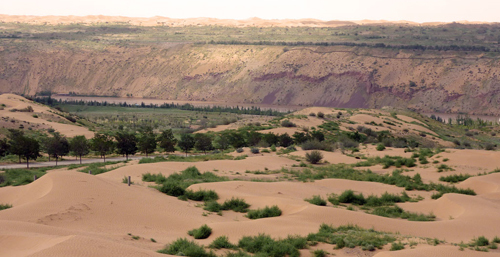 I think Dunhuang is more beautiful. My name is yonanetl I been having a look on your blog and I find it just great, congratulations for all this trips and information you been giving to every one it is really usefull, if you have time I would love to have a small chat with you, I also had have some time working to conect and promote china and iberoamerica. I also do it with real good intetion and pasion.